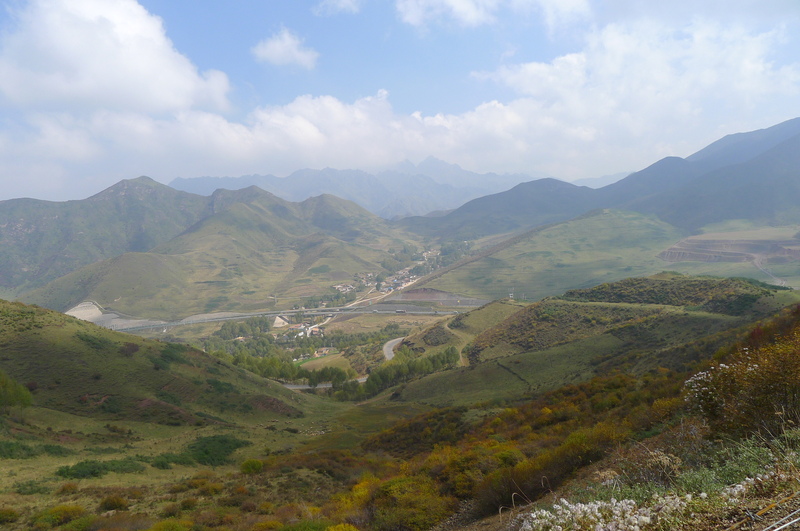 I have often studied maps of the world and been fascinated by Earth’s equivalent of Jupiter’s Red Spot… The Chinese province of Qinghai (青海. 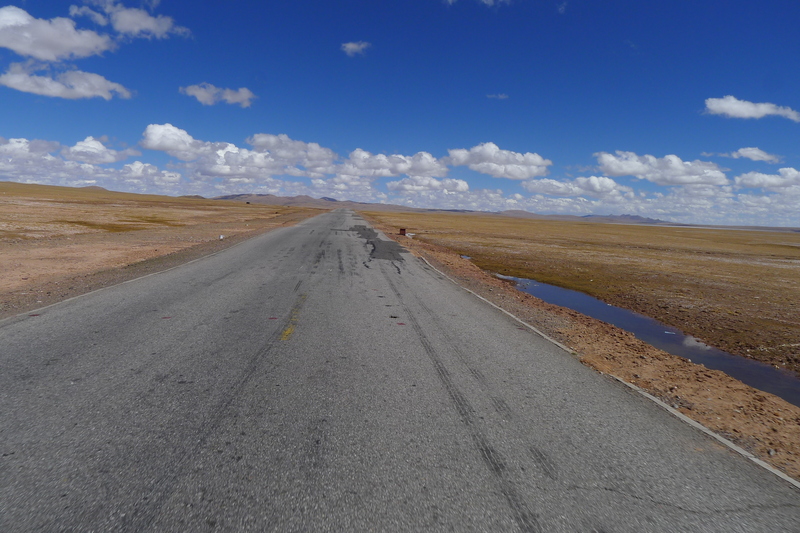 It always looked like one of the most remote parts of the planet and was definitely on my “bucket list” of places to see and ride a motorcycle. 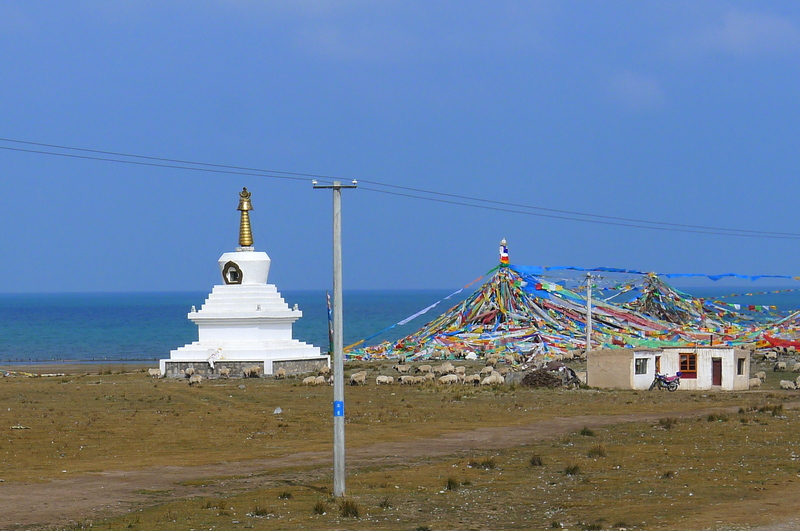 Qinghai, Xinjiang, Xizang, and parts of Gansu and Sichuan forming the Tibetan Plateau .. Qinghai is a province bigger than many countries in the world and the source of the great rivers of China …Chang Jiang (Yangtze River) and Huang He (Yellow River ).. also source of the Mekong River that flows through SE Asia. 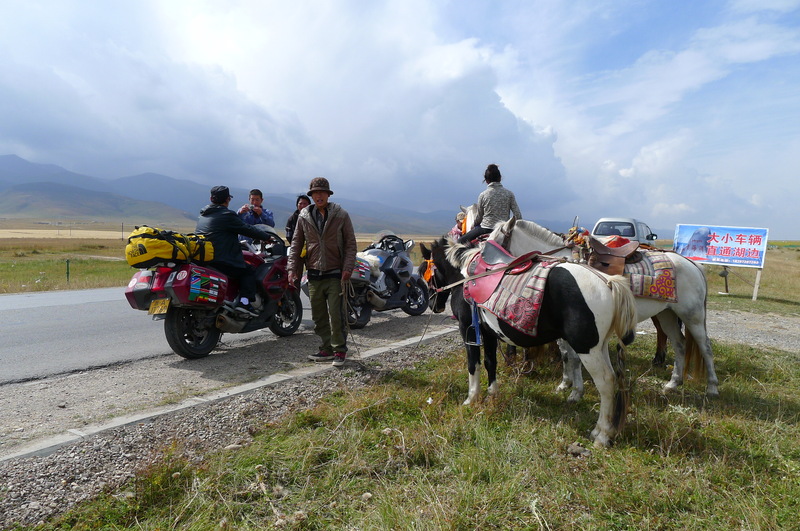 We had been riding high up on the Tibetan Plateau, averaging 4,500 meters for many days. The days were pleasantly warm and sunny with the occasional sudden rain storm that swept across the barren land, but the nights were extremely cold, especially in our tent. We had acclimatized to the altitude but even so any exertion resulted in breathlessness accompanied by a thumping headache. In future, I will definitely have to follow the medical advice of not drinking any alcohol. It’s advised that one drinks a litre of water a day for every thousand meters of altitude. But beer is so nice….. Oh well. 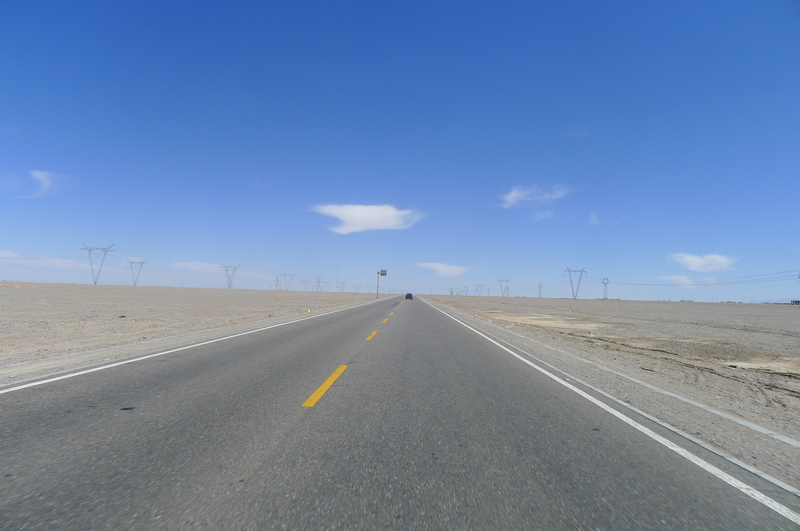 As we continued north on the G109 road towards the remote province of Qinghai we rode on a tarmac surface that undulated like a mini roller coaster on top of the unstable and jelly like permafrost. 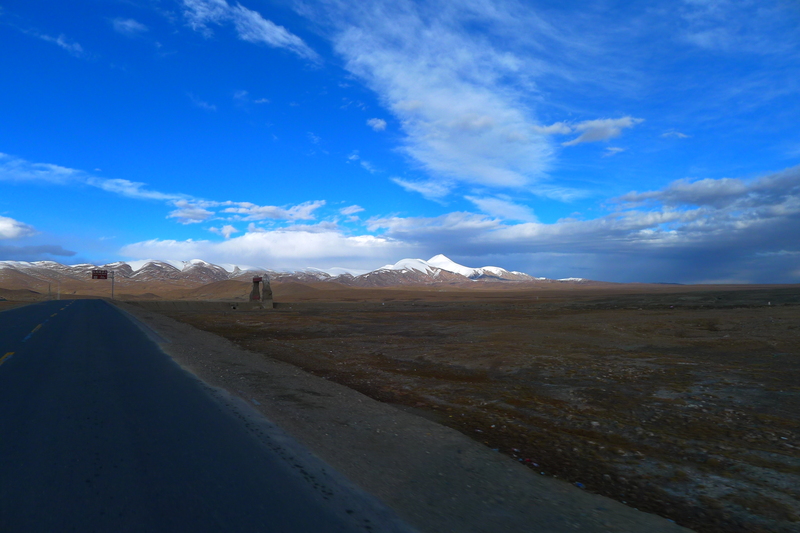 The snow capped mountains constantly reminded us of how high up we were as our road crisscrossed and weaved parallel to the Beijing to Lhasa railway. 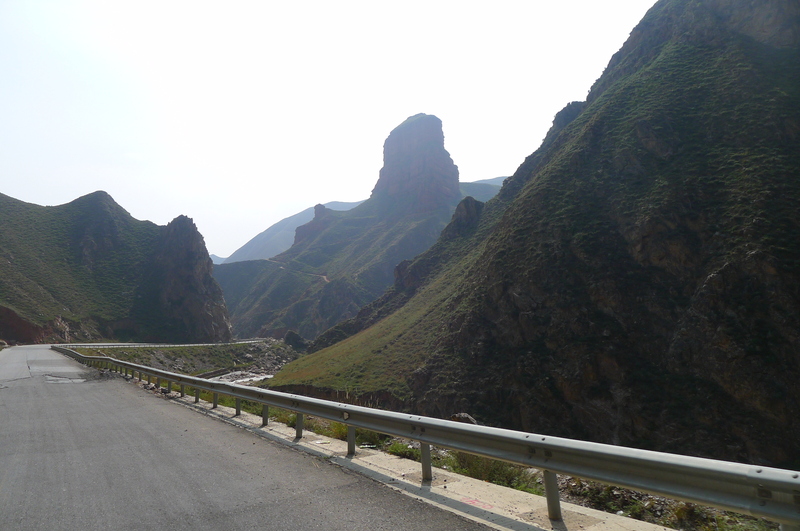 An amazing bit of engineering, but seemingly out of place in such remoteness. There were small security stations posted every 5 or so kilometers along the side of the railway manned by guards with perhaps the most boring job in the world, although with arguably one of the best views. 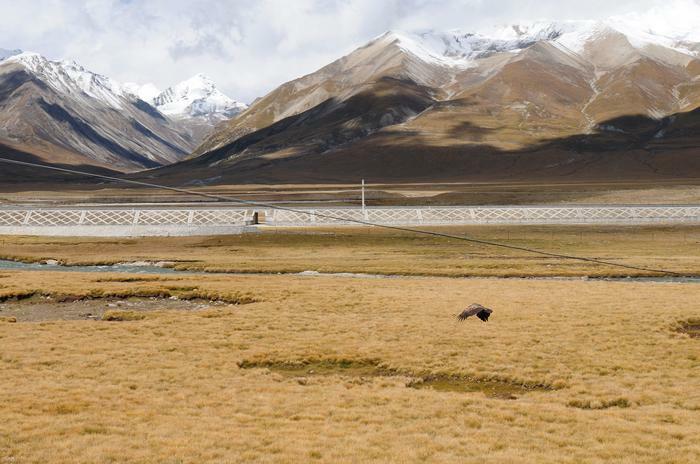 The Beijing – Lhasa railway with vultures flying around looking for carrion. 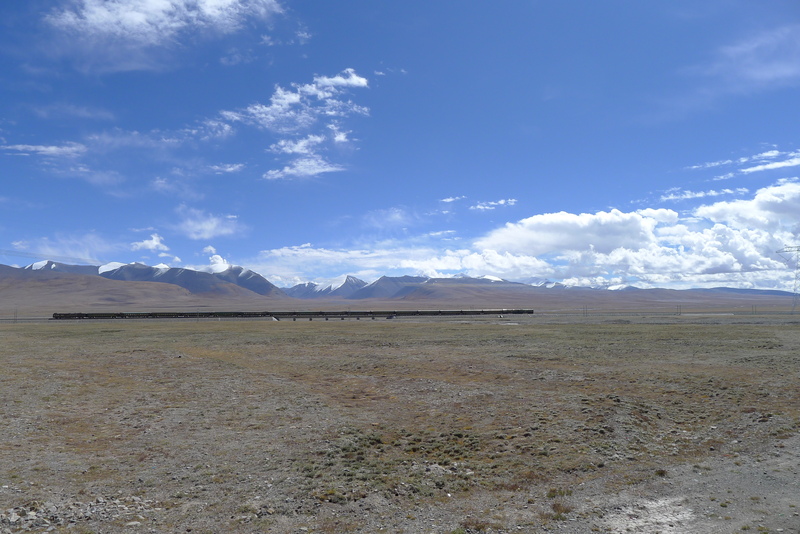 A Beijing to Lhasa passenger train snaking across the permafrost high up on the Tibetan Plateau. 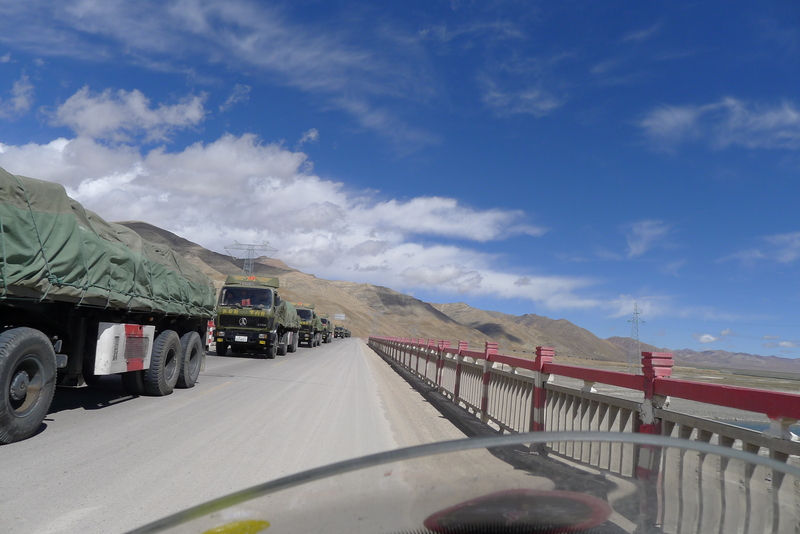 Longer than the trains, the Chinese military convoys going south from Geermu (Golmud) in central Qinghai to Tibet or north to Xinjiang reminding everyone who is in charge. 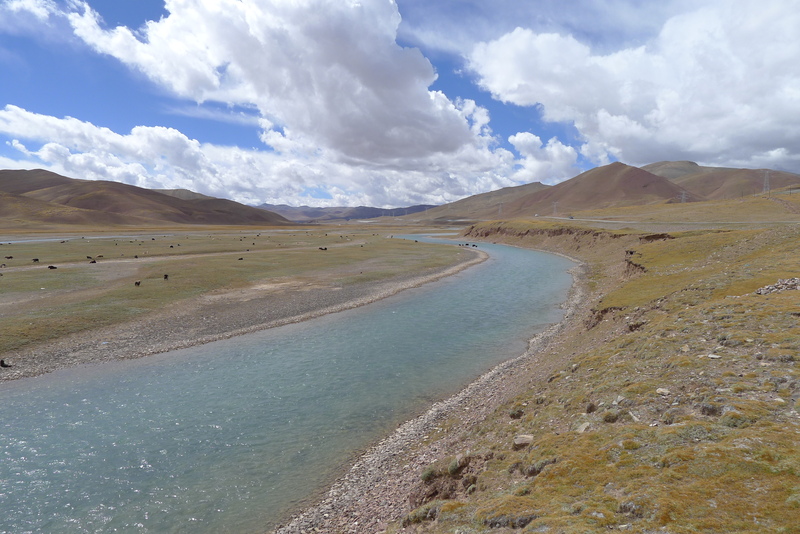 Was seriously thinking of a swim in the river… but full of yaks and just above zero degrees. Another time perhaps. It was later September and the ground had thawed a bit to form little lakes and puddles, however beneath the surface the ground remains frozen, hence the name permafrost. 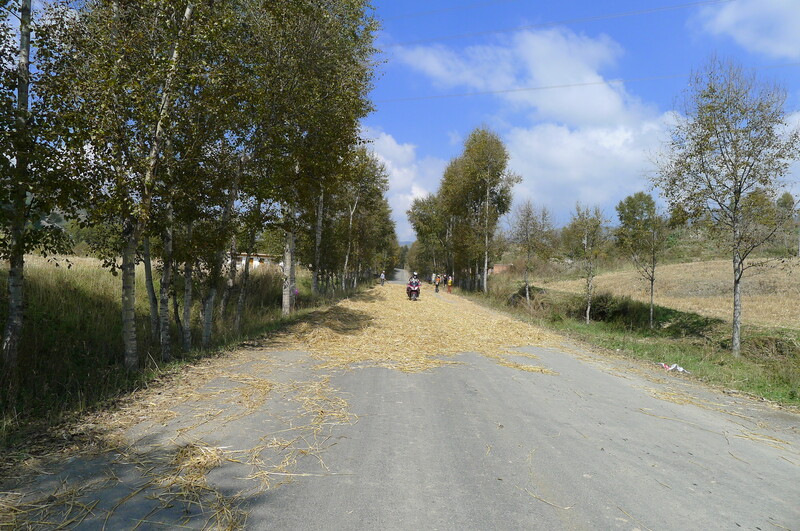 Not being a civil engineer I have no idea how you build a road on such a surface, but it must be a challenge as the road undulates and rolls as if it had been built on jelly. 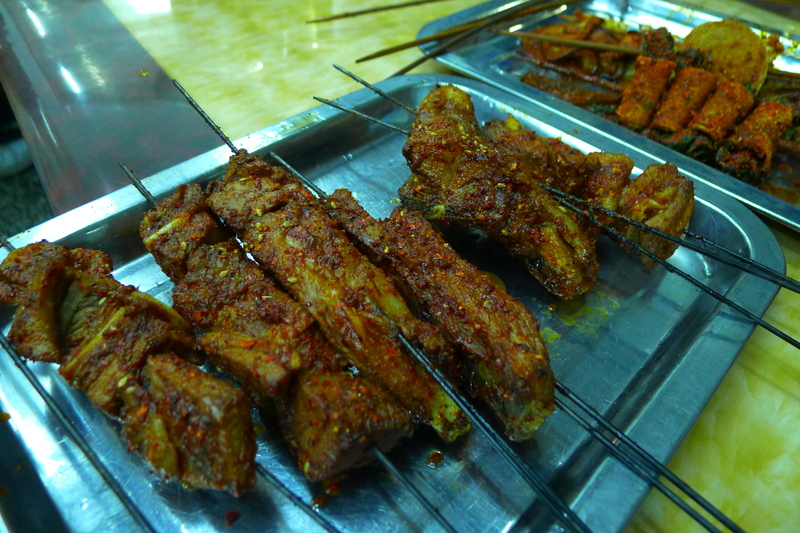 After hundreds of kilometers of mini humpback bridges,dips and potholes it was just as well we hadn’t eaten any breakfast. Seemingly endless ridges of snow mountains and glaciers. Up into the mountains again. 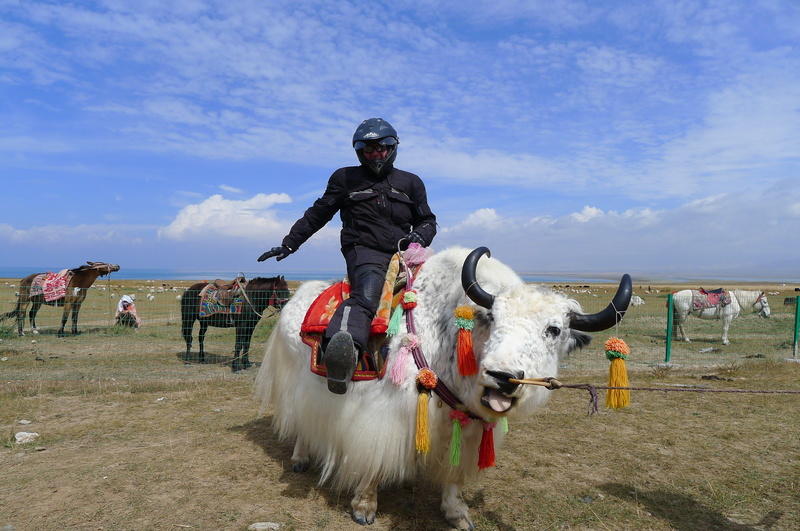 We rode for hundreds of kilometers, and rarely saw any other vehicles except for Chinese military convoys, a few local Tibetans on small motorcycles and the occasional Chinese tourists exploring the area in 4×4 SUVs. 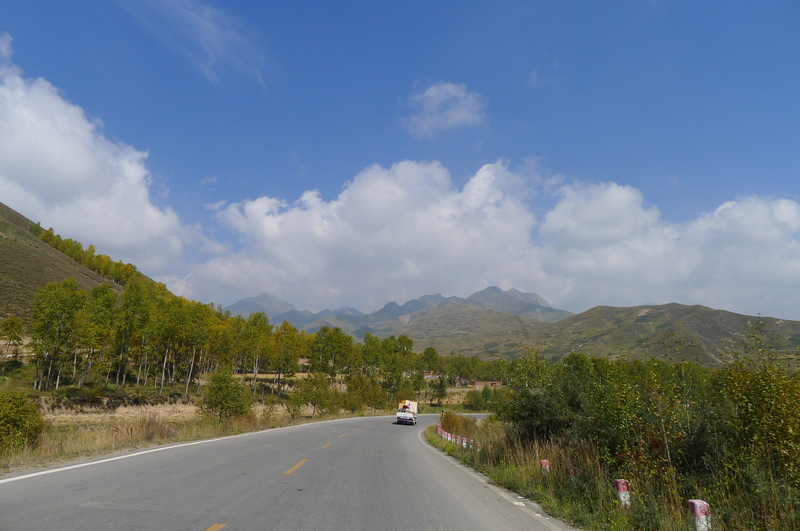 As we continued to ride high up in the mountains the weather changed quickly and we found it increasingly difficult to avoid the rain and occasional snow storms that swept across the plateau. As we had done previously on our expedition we would usually start looking for a place to camp or stay a hour or so before the sun started going down, but the very few settlements we passed looked really run down and uninviting, no hotels or hostels and nowhere dry or stable to pitch our tent and so we continued our ride towards the north. We were told there was a small town we could stay at in the foothills of a snow capped mountain with an impressive glacier, and when we got there the scenery was indeed spectacular, but there was no town, just an ugly looking mining complex that looked out of place and rather sinister among the beautiful surroundings and so as the sun was going down we decided to continue going north towards Ge’ermu (Golmud) another 150 kilometers away, thus breaking the golden rule of adventure motorcycling …not riding in the dark. 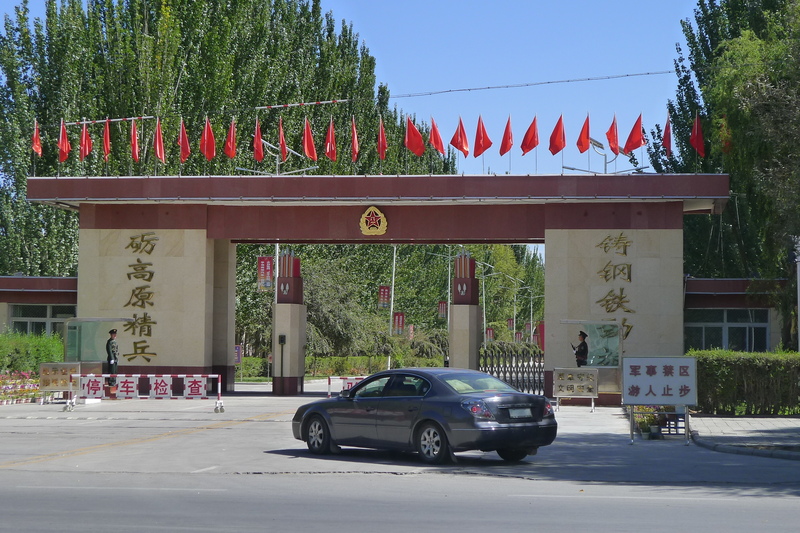 Ge’ermu is a military town that was built by a Chinese army general just after the establishment of the communist regime in 1949 and is now the third largest town on the Tibetan Plateau behind Lhasa and Xining. 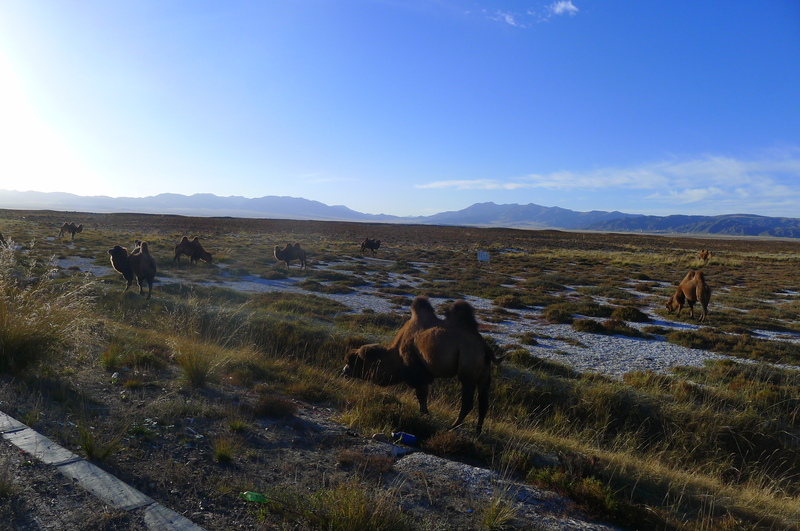 The general’s expeditionary force had crossed the wilds of Qinghai and Gansu by camel train looking for a strategic location to build a garrison that could supply the Chinese military presence in Xinjiang and Tibet. Arriving in any new location in the middle of the night is always a bit disorientating and I was pleasantly surprised how warm the temperature was when we eventually descended into the valley and rode into the city center. Sixty years ago the region would have been incredibly remote and Ge’ermu would just have been a small village that enjoyed the milder climate of the valley and had year round access to water. 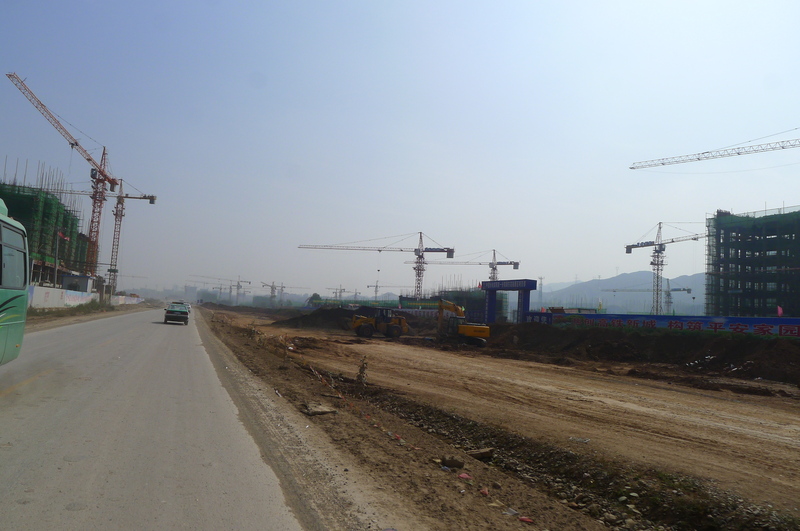 Now it was like many new towns in China…. architecturally dull, dusty, crowded, polluted, and in the case of Ge’ermu full of military personnel, their vehicles, equipment and compounds. Also as far as I could tell I was the only foreigner in town, although not surprisingly given that Ge’ermu is extremely remote and well off the tourist trail. 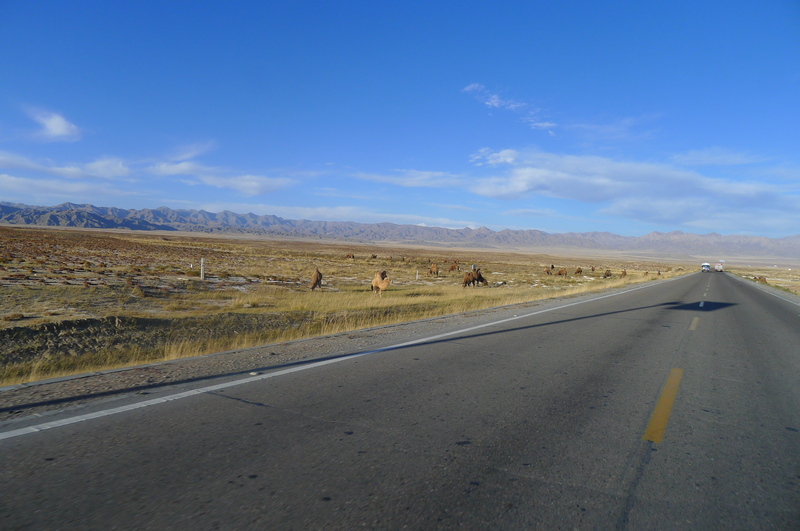 To the west of the city is “no man’s land”… and very few people ever venture into it. Perhaps the location for another adventure in the future. 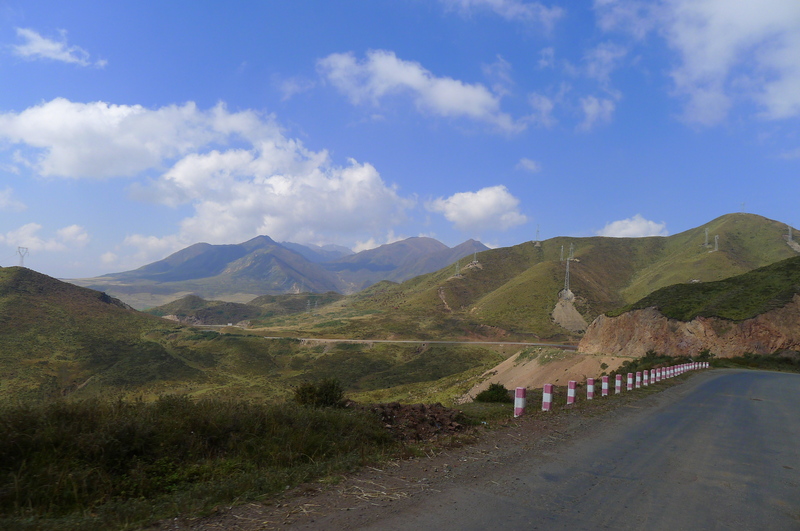 We had ridden over 600 kilometers through the mountains and into the night to Ge’ermu (Golmud) which is essentially a military garrison that was built in the early 1950s in the middle of Qinghai to provide supplies to Xinjiang and Xizang (Tibet). I am back in shorts as the altitude was down to about 2300 meters from the average of over 4,000 meters up on the plateau and so quite warm and pleasant as we explored the city. 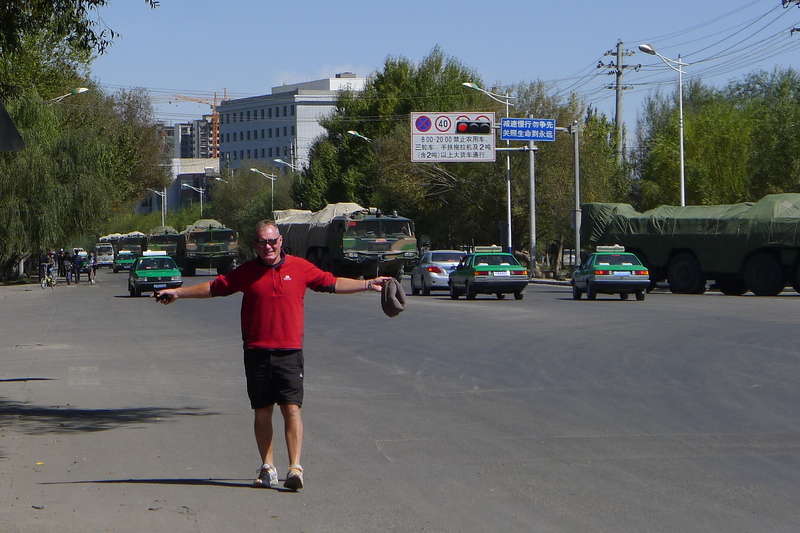 As the military conveys roared up and down the highway, these two little toddlers played in the central reservation. The bikes always drew crowds. 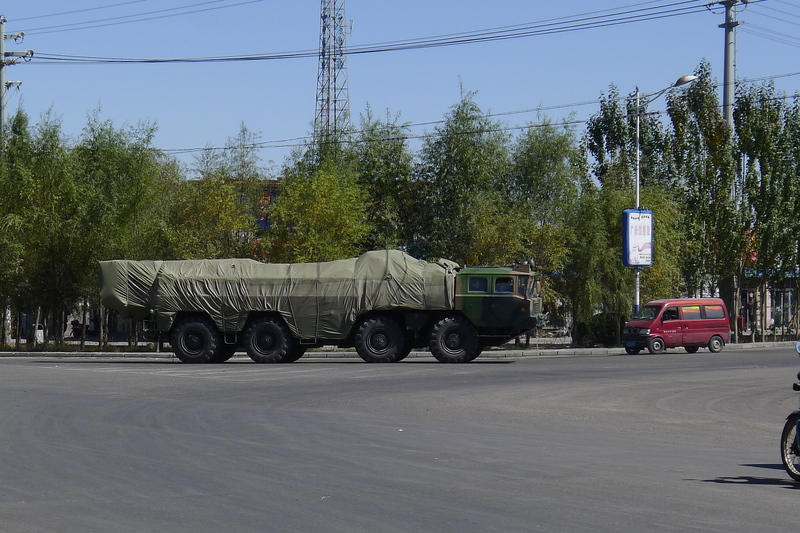 In China cars are for rich people and bikes are for poor people … so what are these huge things? Why are you riding them? Why don’t you buy a car instead? They are foreign, right? 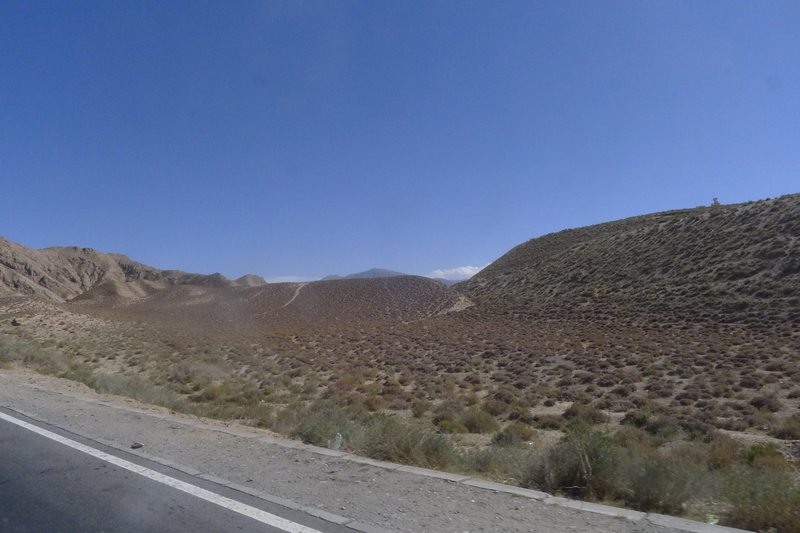 As we left Ge’ermu the big yellow spot on the satellite picture started to make sense … its a huge desert. 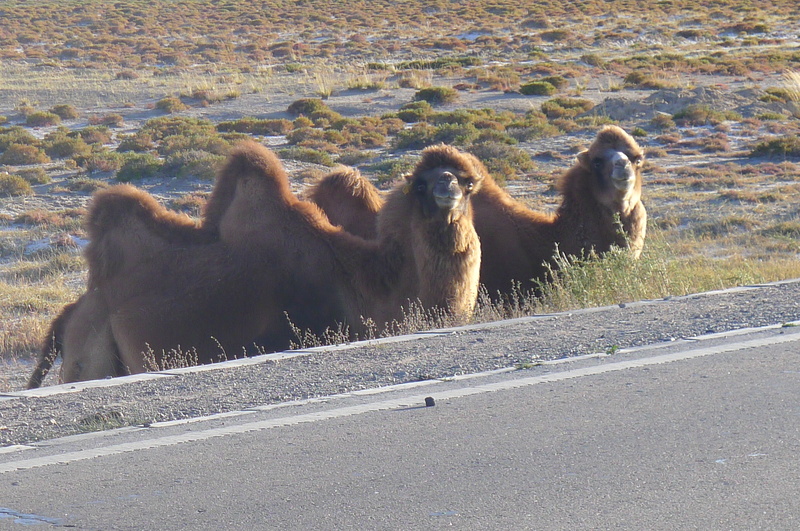 Now we had hundreds of kilometers of quite boring desert to ride along. Lots of rubbish strewn along the side of the road. Not as beautiful as the deserts in Sudan or Egypt. Also, a police officer kept throwing water bottles at us from the window of an unmarked police car (ahead in the picture) .. no idea why … dangerous and infuriating. 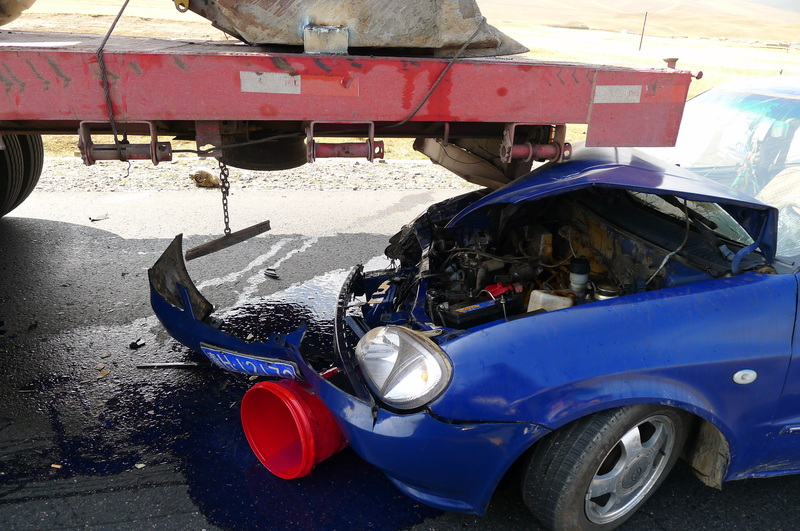 Its not because you are an inconsiderate, selfish, crap driver … no …. you’re just unlucky. 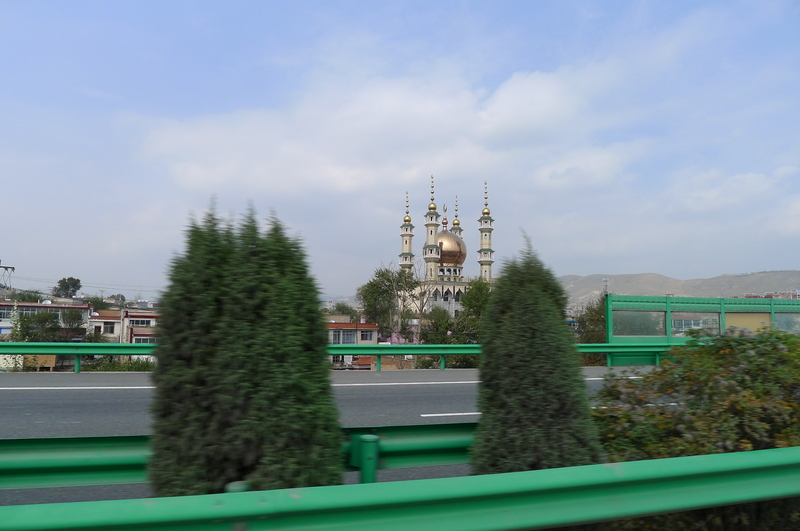 Riding east towards Gansu … becoming more Muslim. 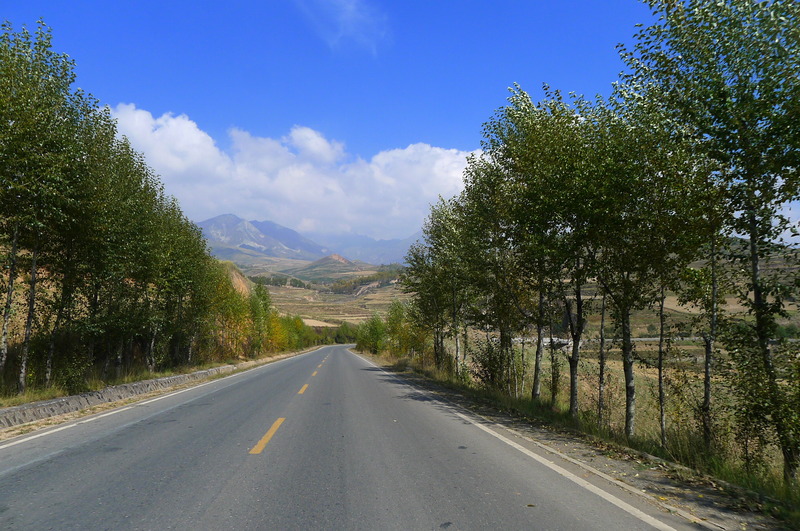 Xining, capital city of Qinghai. 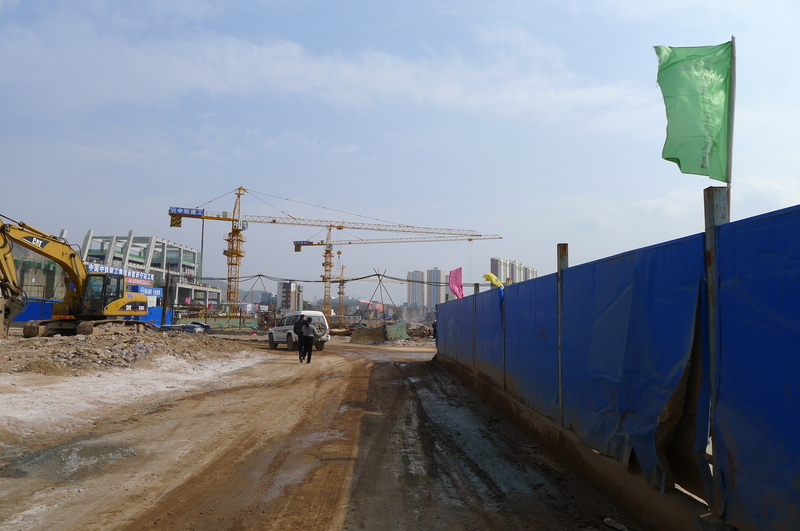 Basically a huge construction site. 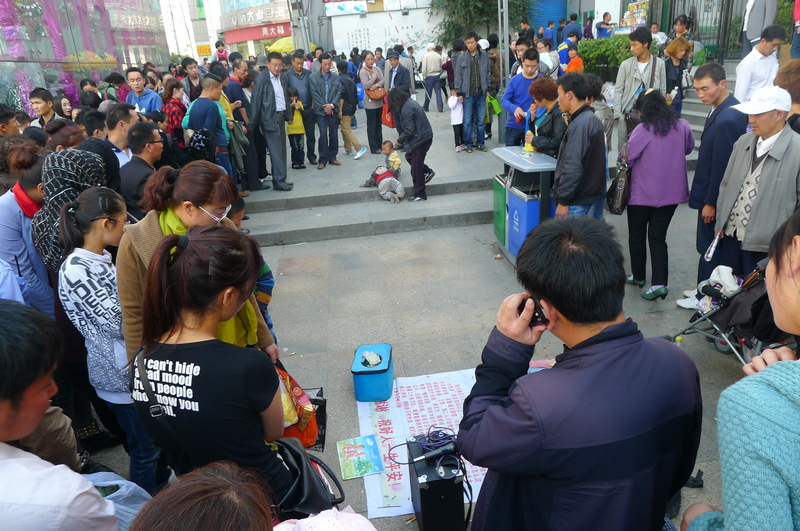 And for the afternoon’s entertainment in Xining ?… a disabled baby wriggling up and down some steps for hours on end. Nice! 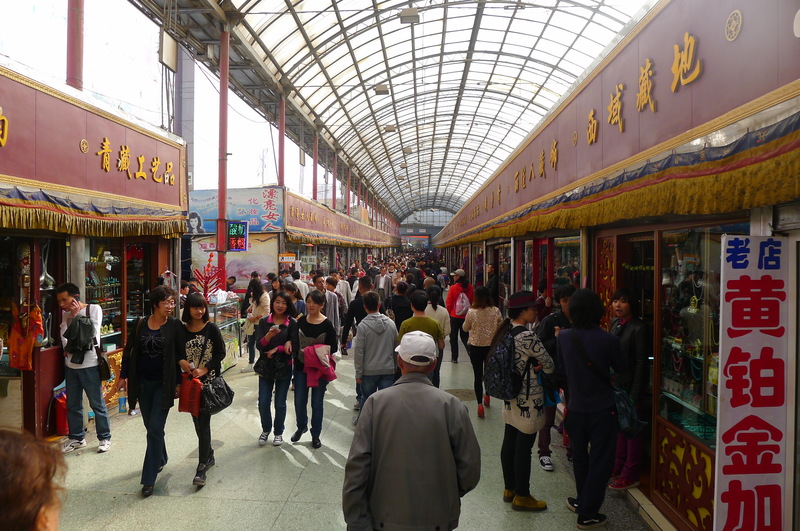 Market and food street in Xining…. 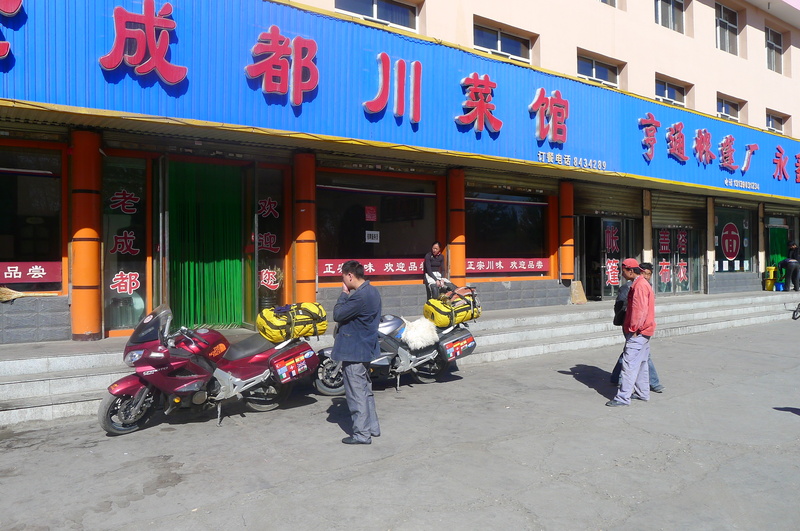 I heard a Chinese guy say how terrible it was that Xining was now so full of smelly foreigners… As I was the only one I saw in the whole city he must have meant me and met my boots. 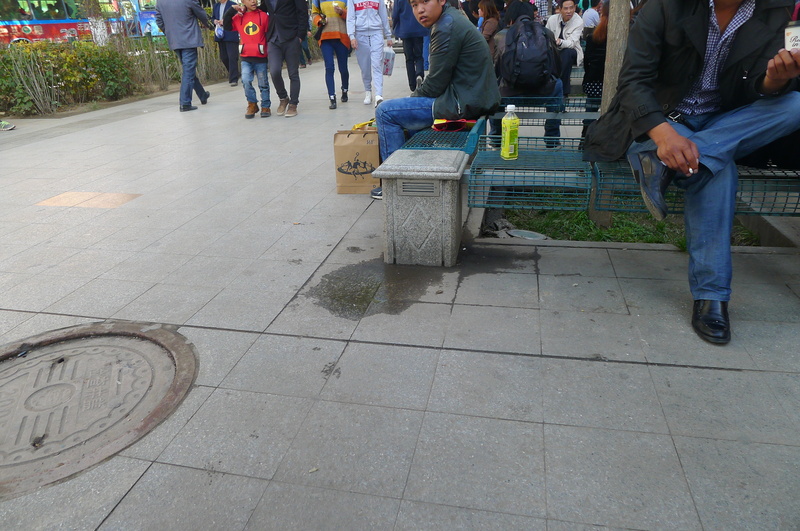 Who in their right mind would use a public lavatory in China anyway? 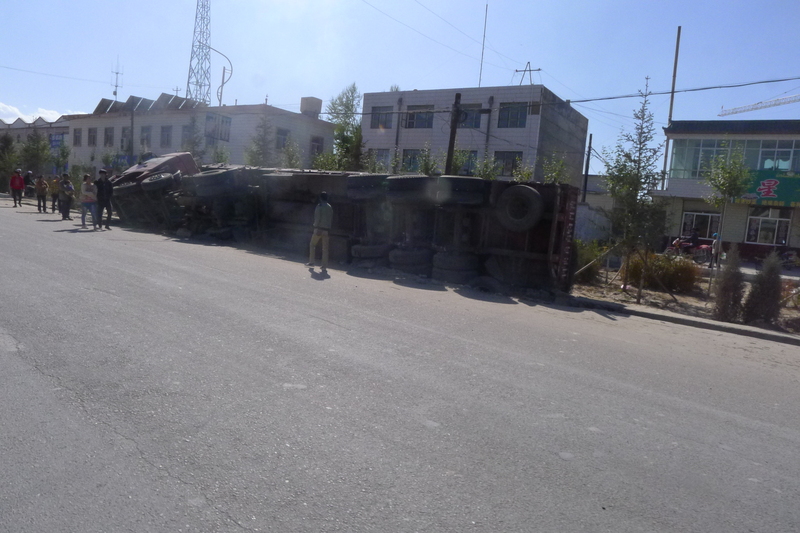 Xining? I’m quite sure it will be lovely when its finished. 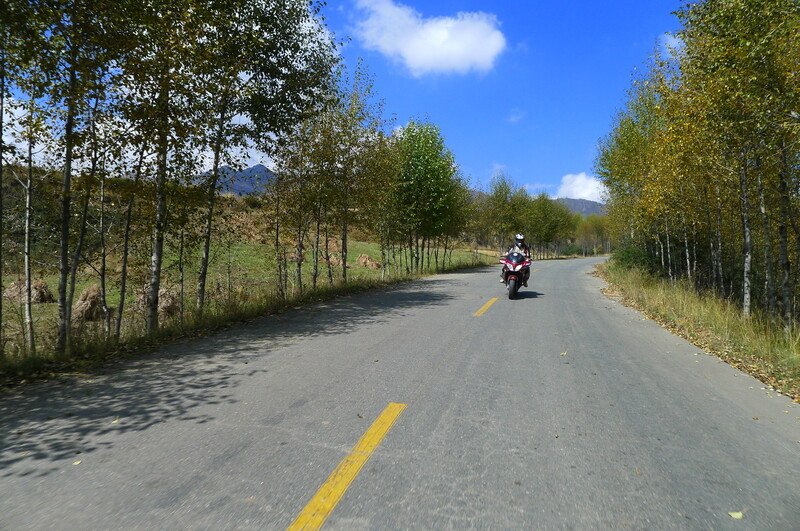 Motorcycles are not allowed on highways in China and so we had to ride around, up and over the mountains and through every village and town, which is great if you are not in a hurry and the weather and road surface are good. 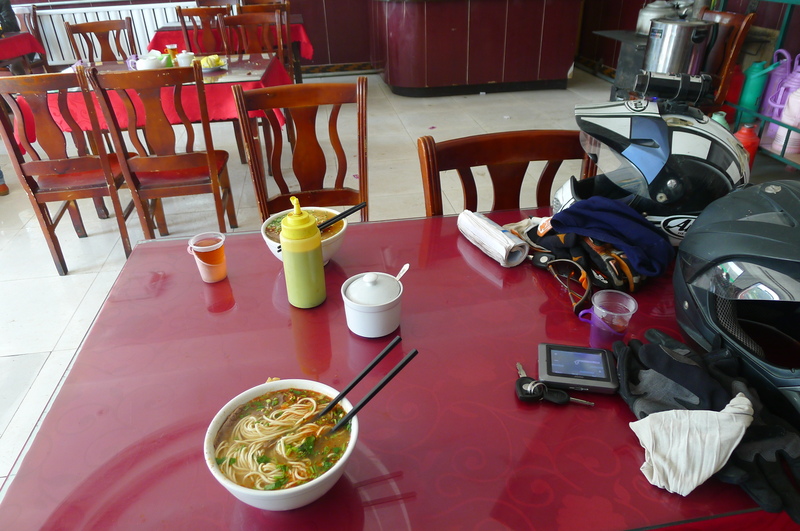 Stopping at a local restaurant for Lan Zhou La Mian … a local specialty and very delicious. 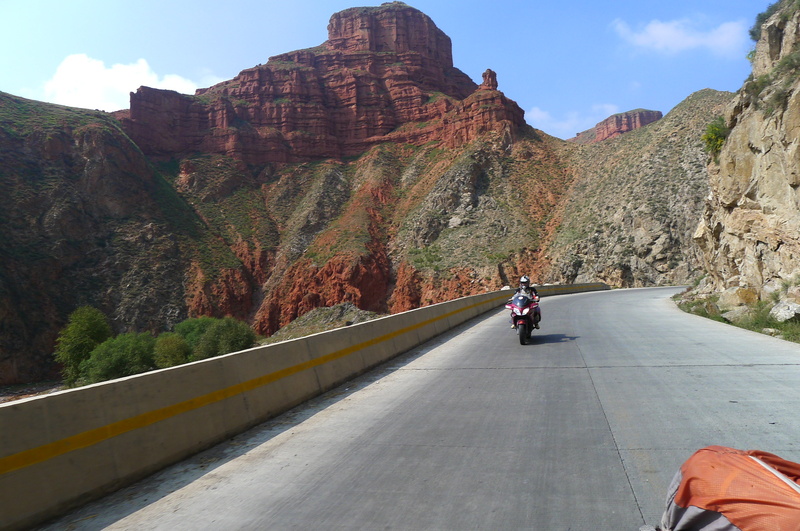 Riding through the canyons leading to the Yellow River in Gansu. 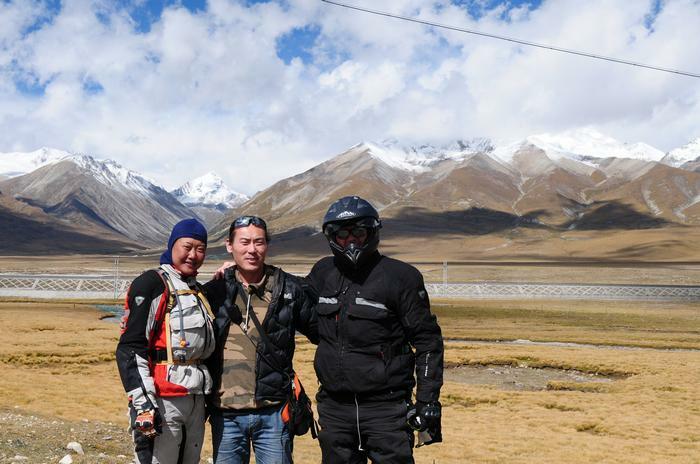 This entry was posted in CF Moto 650TR, China, Fanny, Route, Rupert, Uncategorized, Visas, Yak. 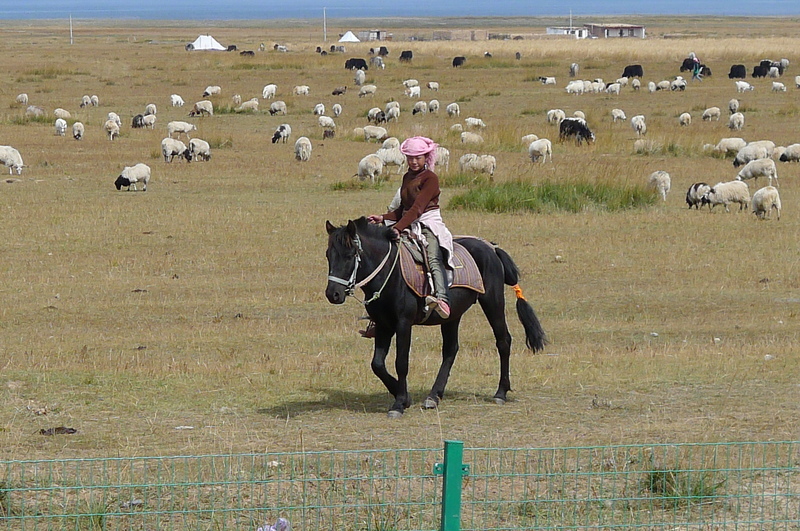 Tagged China, 青海， 中国， 牦牛，骆驼, grasslands, pony, Qinghai, Xining, yak. You didn’t say what you did to piss off the policeman that made him lob bottles at you? I’ve read this blog long enough now to know you better than that. I did make a bit of a fuss at a petrol station that made us fill up teapots with petrol and have to carry them 50 meters to a bike parking bay and go backwards and forwards several times spilling fuel everywhere. I might have commented what a dumb and stupid and counter productive practice it was and upset the local rozzers (plain clothes police) who had followed us. 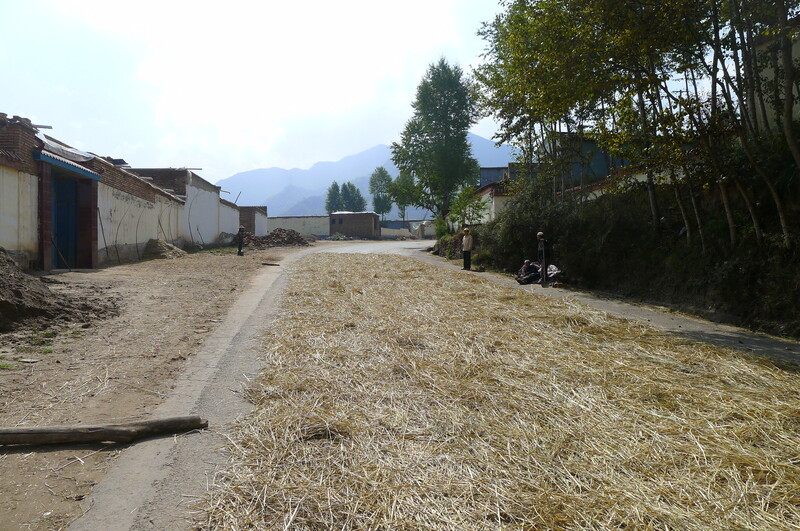 It does show that the authorities and police in remote places like this (and it doesn’t get more remote than here) are totally unaccountable and can do what ever they like. 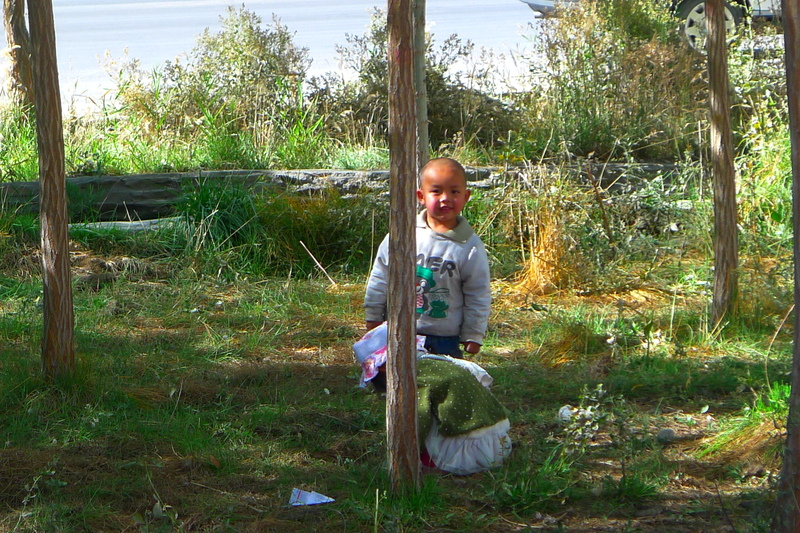 I expect they are used to bullying the Tibetans and think all foreigners should tow the line and kowtow. NOT THIS ONE. 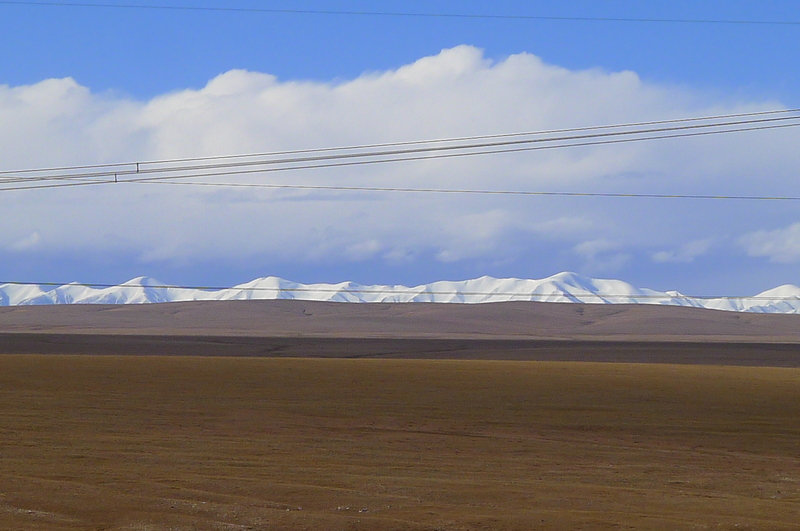 So that was Qinghai. 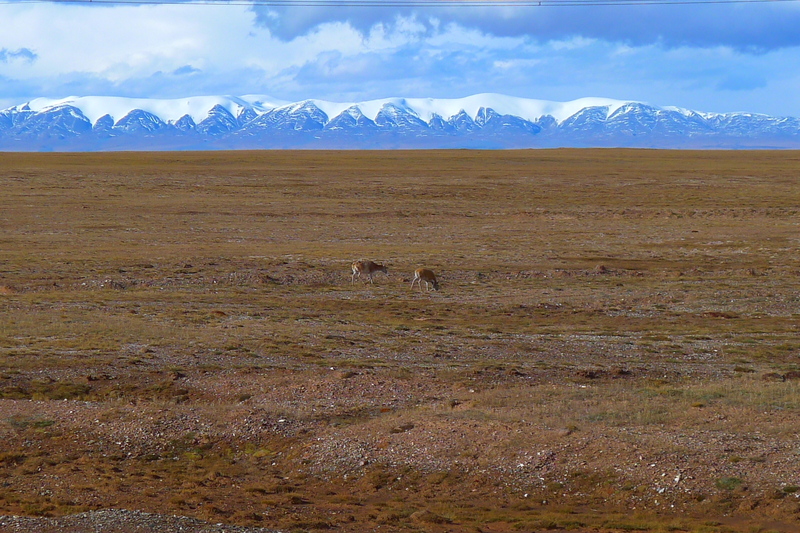 What a truly remote part of the world it is. 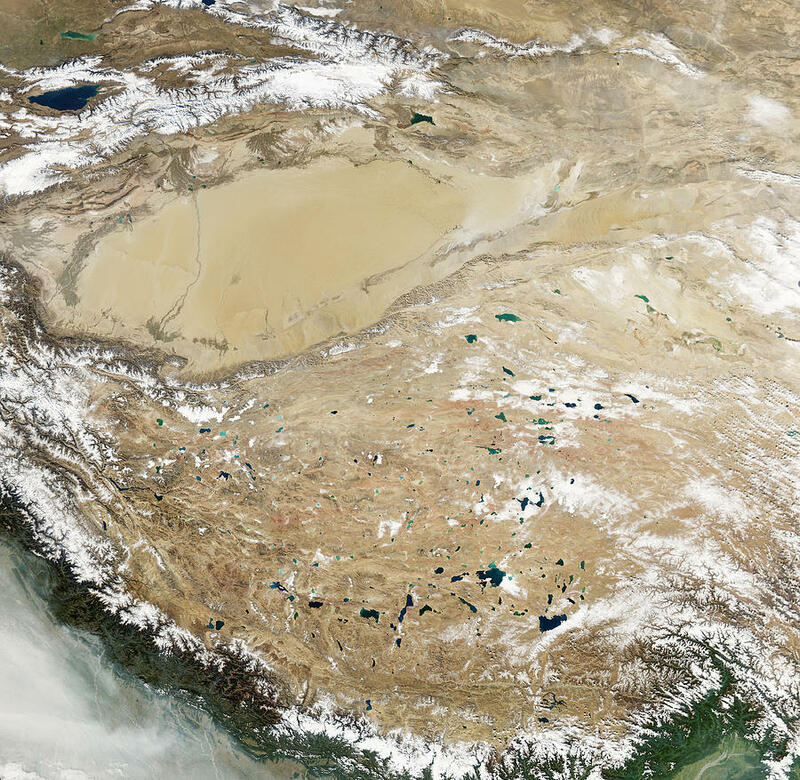 The no man’s region to the west is rarely ventured into by people nowadays …no roads, restrictive Chinese politics and policies and very harsh conditions. 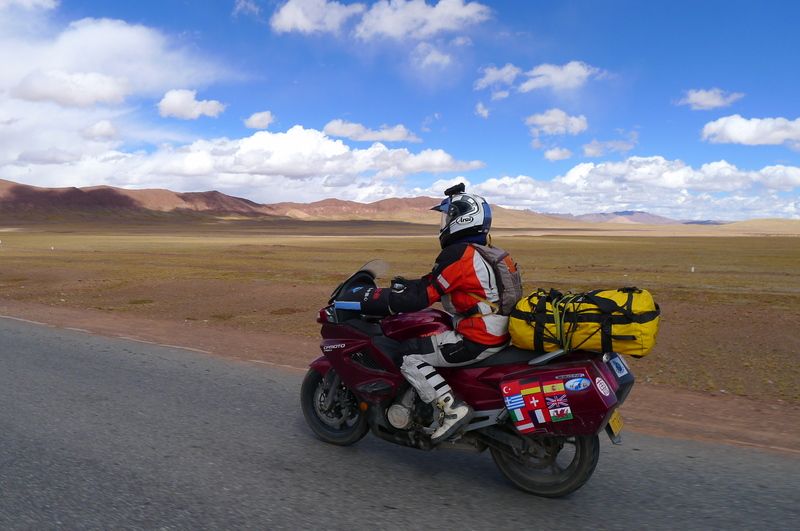 I have vowed that one day I will go back on a light adventure bike and ride to Xinjiang and Mongolia and beyond.